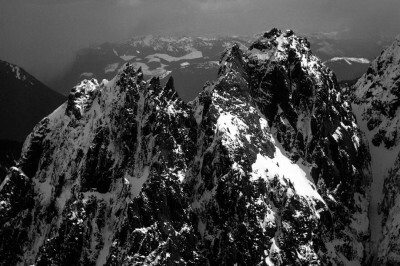 In the late 1980’s I climbed with Kevin Wood, a person of unique personality. He suggested we climb the Northeast Spur of the North Peak of Mt. Index which he had climbed a couple of years prior. It was a late hot summer weekend. We arrived at the Lake Serene trailhead Saturday morning and hiked the old trail which if anyone remembers was rather steep in sections. The lake was free of day hikers and Kevin decided to swim to a large rock and began doing naked yoga poses. I found a smooth rock and stripped down for some superb sun bathing. It wasn’t long before I heard a voice and noticed a single woman walking up the shore trail. She smiled and stated the obvious that it was a warm beautiful day. After an hour Kevin swam to shore and we both dressed and gathered our packs and gear for our scramble to the nights bivy spot. As we started walking along the shore we passed the only other person who had hiked to the lake, the woman from earlier was heading back down the trail. I smiled sheepishly as we passed and said what a great day. She agreed that it was and how she had the lake all to herself except for two naked guys. We laughed as we passed. At the end of the lake was a talus slope and at its top we arranged our camp. We quickly headed to sleep before a sunrise start to the actual climb. It has been a long time since the climb so memories are unclear. I remember the first couple of pitches being straightforward. It was a section called the rock bowl where the difficulties began. Kevin led the pitch which went up and then to the right. It was a smooth wall and in leather mountain boots I remember wishing for rock shoes. I recall using an old piton for a foothold as I traversed up and across the face. The other foothold was a down sloping step and I had to press my body to move pass a bulge in the rock and nearly fell. I somehow caught myself and continued toward Kevin and his belay stance. He complimented me on saving myself and possibly him as the belay was not all that solid. We then climbed around to a not obvious ledge that led to a long gully that snaked upwards. There was no place to place protection and the rock was water worn smooth. I thought at that moment that this would be a horrible experience if it began to rain as the gully was the natural water drainage from the higher reaches of the peak. I don’t remember the next couple of pitches until the North Rib. The rib was a vertical tower and we climbed to the top and along an airy section to a heather bench below the false summit. It was a couple of additional pitches and a lot of loose rock scrambling to finally reach the summit. The summit area was small and we sat looking the 5500 vertical feet straight down to Lake Serene. I looked around and it was quite clear that the only logical way off of this thing was the way we had climbed up. The descent took longer than the climb up. One belay anchor was a large bush that we dug some dirt away from its base with a sharp rock and looped two large runners . As Kevin began to rappel he yelled back “to not load the anchor”. I shook my head and laughed to myself (I have used this instruction a few times since to the shock of a couple of climbing partners). Five and a half hours later we were off the route and hiking back to our car just before sunset. A long day and one that I enjoy remembering every time I drive over Stevens Pass.